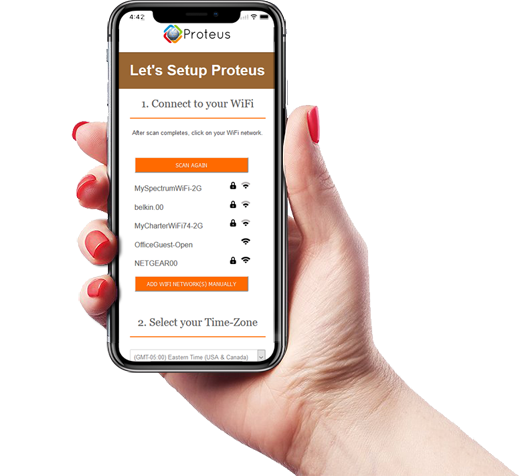 Proteus Home series presents smart wifi solutions for your sensing needs. Email/ Text alerts. Audible buzzer. Quick mounting float switch triggers when water rises above set level inside the sump pit. Configure alerts when motion is detected. Or if no motion is detected for a set time. Select days of week, hours of day, schedules. Accurate Temperature/ Humidity sensors to keep track of ambient settings even when you are not home. Magnetic switch sensors configurable to 'Normally Closed' or 'Normally Open'. You pick the application. Proteus PRO series presents advanced sensing solutions for your industrial monitoring applications. Friendly interface, data APIs, software plugins, cloud push and more. Temperature, Humidity, Contacts, Line Voltage and more. Works with Nagios and other software. Plugins available. Spot and Rope Style sensors for water, chemical leaks. Add-on sensor options. Get alerts before damage spreads. Monitor power lines, fluctuations, and ensure power integrity 24x7. Get alerts immediately. Robust interface to add internet connectivity to the most common sensors. Multiple sensor power options. Offset calibration. Remote monitoring and relay contact option. Proteus C5 - Clamp on Sensor to monitor ON/ OFF status for your electrical equipments. •	Send alert emails and text messages to multiple emails and phones. •	Audible alert immediately notifies of any sensor reading fluctuations to alert local personal. Clamp On WiFi Electric Load Sensor . Proteus C5 WiFi electric current/ load sensors monitor the ON/ OFF status of your electrical devices such as motors, pumps, household items such as television, microwave, sump pumps, etc that consumes atleast 500mA current at 110V or 220V AC and sends you alert email/ text messages to your inbox or smart phone. C5 supports 802.11b/g/n Wifi and connects to your home or office Wi-Fi networks (2.4GHz). Easily configure your sensor to send alerts. Proteus comes in a surprisingly compact feature rich package. Plug it right into a wall outlet (100-240V AC). No batteries to replace. It connects directly to your wifi, with no additional hubs or gateways required. Oh, and it wont block your second wall outlet. Proteus comes with current sensing technology that does not need any cutting or splicing of your power cord. Simply clamp on the sensor node over your power cord, and connect to the base unit. Simple and easy. You can use your smart phone, tablet or a laptop to setup the sensor. Connect your phone/ laptop to ProteusSetup-xxxxx network. Wait for setup screen to popup. Select your wifi, enter wifi password. Proteus comes with a smart built-in buzzer. This loud audible alert will notify you locally when the alarm trips. You can program the buzzer to snooze automatically after few minutes, or you can also disable the buzzer completely and still get the alert notifications. Get Notifications by emails, text , call alerts when alarms are tripped. Add multiple emails, and phone numbers. Get Notified instantly. Got a new router? Changed your wifi password? Simply reset the sensor by pressing the reset button for 5 seconds leading to a long beep. Continue to setup the sensor with your new wifi network. With smart monitoring from our cloud, you will be notified as quick as 10 minutes after power or wifi goes down. You will be notified if the sensor stops working even when power and wifi are good. When the sensor comes back online after power, wifi is restored or sensor issues resolved, you will be notified as well. C5 Clamp-on Load Sensor with 25 ft Cable. All Proteus WiFi Sensors require a 2.4 GHz Wi-Fi network for operation. Even when power is on, a device may or may not be running. If the equipment fails to turn on due to a fault, just knowing power is ON is not enough. With current based monitoring, the sensor trips only when the device is ON. Voice call alerts are part of the advanced options package and is a paid option. All proteus sensors, unless specified otherwise, are powered directly from a 120-240V AC wall outlet. Simply plugin the sensor to a standard wall outlet and you are good to go. © 2019 Proteus Sensor. All Rights Reserved.